Any abnormalities in the regular rhythm of the heart, such a slow heart rate, are a source of great stress and uncertainty for most menopausal women, especially when they occur for the first time. However, the underlying causes of this common condition often do not indicate serious health problems. Keep reading to learn more about slow heart rate, its symptoms, and causes. What Is Slow Heart Rate? Medical term for slow heart rate is bradycardia, and it is defined as a heart rate of less than 60 beats per minute. For comparison, a normal heart rate ranges from 60-100 beats per minute. Slow Heart Rate: Should I Be Worried? 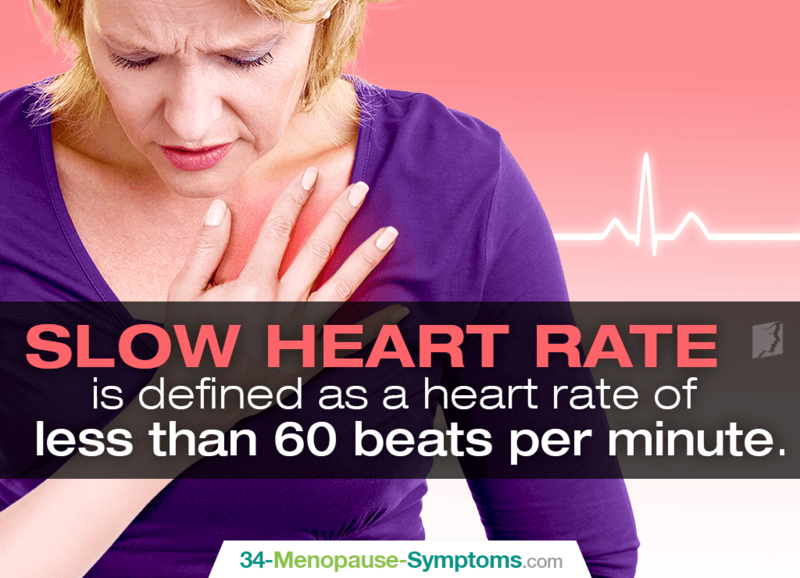 The severity of these symptoms vary from woman to woman and depends on the underlying causes of slow heart rate. Some women do not experience any, whereas for others, bradycardia significantly interferes with their daily activities. As we age, our heart changes as much as other parts of the body, which results in typically slower heart rhythm among women of age 65 and older. Higher prevalence of heart disease is also age-related. Tissues of the heart are often damaged by a heart attack or other heart diseases and infections, resulting in bradycardia. Congenital heart defect can also be the cause. Certain medications' side effects, such as those used to treat hypertension or heart problems, include a slower pulse. An incorrect dose can also result in that. Also knows as “athletic heart syndrome”, athletic bradycardia is very common among sportswoman and trained athletes, and it is characterized by enlarged heart and low resting heart rate. Fluctuations in calcium and potassium levels, minerals essential for a healthy heart can disrupt its functioning. Thyroid hormones imbalance, particularly low T3 and T4, can slow down the metabolism, leading to bradycardia. It is understandable that heart problems are worrisome to all middle-aged women, but being thorough and observant about your body can help you ease your worries and be more pro-active about your health. Regular physical exams and paying attention to any new symptoms you experience are helpful in early diagnosis. You might also be interested in reading about the things to avoid if you have an irregular heartbeat, such as smoking, alcohol, and others. Longo, D.L., Fauci, A.S., Kasper, D.L., Hauser, S.L., Jameson, J.L., Loscalzo, J. (n.d.). Harrison's Principles of Internal Medicine, 18e. Chapter 232: The Bradyarrhythmias. Available from McGraw-Hill Medical Library. If you have ever experienced palpitations, you might be interested in reading on to discover what palpitations are and what their causes are.